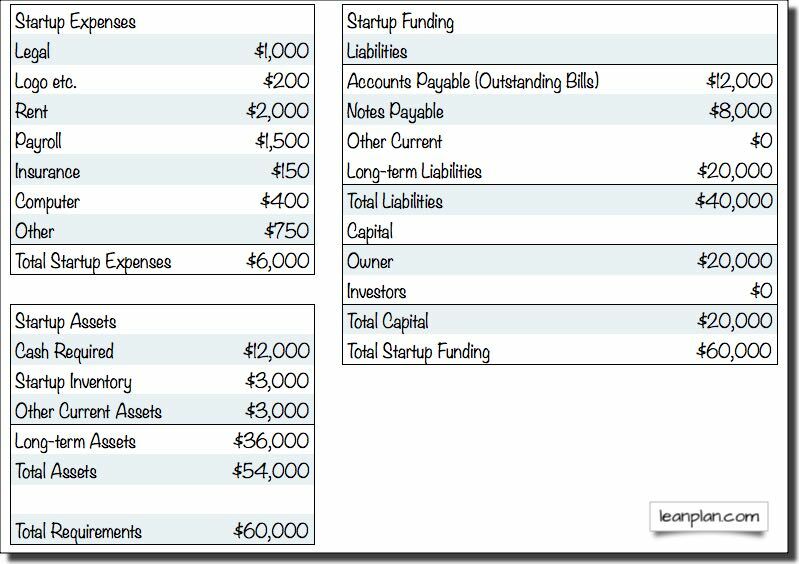 Startup expenses: These are expenses that happen before the beginning of the plan, before the first month of operations. For example, many new companies incur expenses for legal work, logo design, brochures, site selection and improvements, and signage. If there is a business location, then normally the startup pays rent for a month or more before opening. And if employees start receiving compensation before the opening, then those disbursements are also startup expenses. Startup assets: Typical startup assets are cash (the money in the bank when the company starts), business or plant equipment, office furniture, vehicles, and starting inventory for stores or manufacturers. Notice that on the same worksheet Garrett used to estimate starting costs, he also estimated starting funding, on the right side of the illustration. Books have to balance, so the initial estimates need to include not just the money you spend, but also where it comes from. In the case above, Garrett had to find $124,500, and you can see that he financed it with Accounts Payable, debt, and investment in various categories. 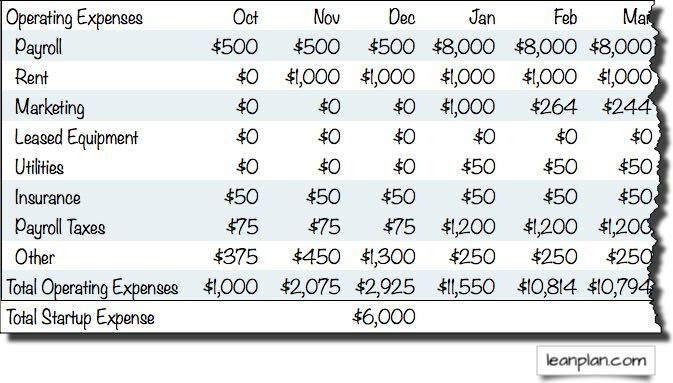 That Starting Balances illustration in the Projected Balance Sheet chapter also shows how those initial balances go into the Projected Balance Sheet. Here is another simple example: the starting costs worksheet that Magda developed for the restaurant I used in Chapter 7 for basic numbers. Magda’s list includes rent and payroll, the same as in her monthly spending, but here they are included in starting costs because these expenses happen before the launch. I included rent and payroll because they point out the importance in timing. The difference between these as startup expenses and running expenses is timing, and nothing else. Magda could have chosen to plan startup expenses as a running worksheet on expenses, starting a few months before launch, as in the illustration below. I prefer the separate lists, because I like the way the two lists create an estimate of starting costs. But that’s an option. Obviously the goal with starting costs isn’t just to track them, but to estimate them ahead of time so you have a better idea, before you start a new business, of what the financial costs might be. Breaking the items down into a practical list makes the educated guess a lot easier. Ideally, you know the business you want to start, you are already familiar with the industry, so you can do a useful estimate for most of the startup costs from your own experience. If you don’t have enough firsthand knowledge, then you should be talking to people who do. For others, such as insurance, legal costs, or graphic design for logos, call some providers or brokers, and talk to partners; educate those guesses. How much cash do you need in the bank, as you launch? That’s usually the toughest starting cost question. It’s also prone to misinformation, such as those alleged rules of thumb you can find everywhere, saying you need to have a year’s worth of expenses, or six months’ worth, before you start. It’s not that simple. For most businesses, the startup cash isn’t a matter of what’s ideal, or what some expert says is the rule of thumb – it’s how much money you have, can get, and are willing to risk. That low point comes, theoretically, in the third month of the business, March. The low point is $11,609. Obviously that’s just an educated guess, but it’s based on assumptions for sales forecast, expense budget, and important cash flow factors including sales on account and purchasing inventory. So it’s better than a stab in the dark, or some rule of thumb. Just as an example, the total spending with the estimates shown here, the theoretical “year’s worth of spending,” is $182,000 (which you don’t see on the illustration, by the way, but take my word for it). The total for the first six months is $93,000. If Magda sticks to those old formulas, she can’t start the business. She is able to raise enough money, between loans and her savings, to put $12,000 into the starting cash balance. So that’s what she does. Then she launches and continues to have her monthly reviews, and watch the performance of all key indicators very carefully. There is no magic startup costs estimate for a given business. Every startup has its own natural level of startup costs. It’s built into the circumstances, like strategy, location, and resources. Call it the natural startup level; or maybe the sweet spot. For example, in the illustrations above, Magda’s restaurant deli in the office park needs about $60,000, and Garrett’s bicycle store needs about $125,000. The level is determined by factors like strategy, scope, founders’ objectives, location, and so forth. In both cases, the entrepreneurs have lists of assets they need and expenses they’ll incur. Let’s call these lists the natural startup level, which is built into the nature of the business, something like DNA. 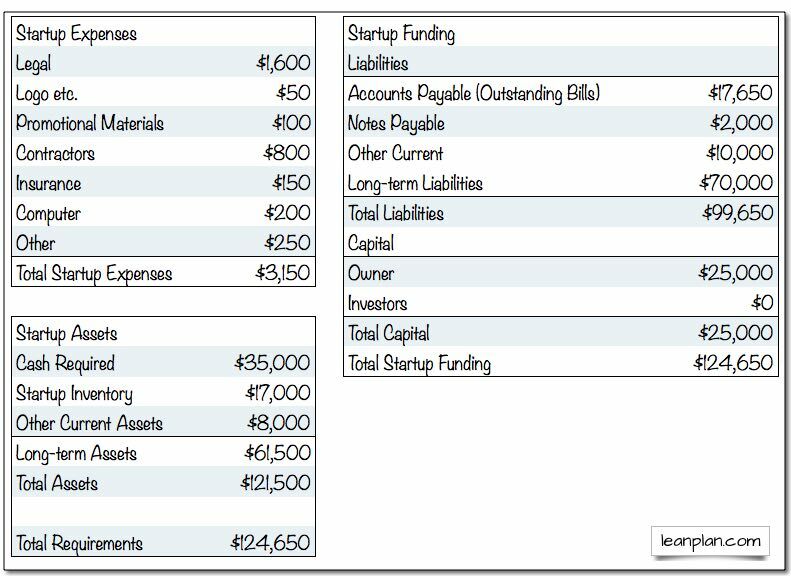 Startup cost estimates have three parts: a list of expenses, a list of assets needed, and an initial cash number calculated to cover the company through the early months when most startups are still too young to generate sufficient revenue to cover their monthly costs. It’s not just a matter of industry type or best practices; strategy, resources, and location make huge differences. The fact that it’s a Vietnamese restaurant or a graphic arts business or a retail shoe store doesn’t determine the natural startup level, by itself. A lot depends on where, by whom, with what strategy, and what resources. While we don’t know it for sure ever — because even after we count the actual costs, we can always second-guess our actual spending — I do believe we can understand something like natural levels, related to the nature of the specific startup. Marketing strategy, for example, might make a huge difference. The company planning to buy Web traffic will naturally spend much more in its early months than the company planning to depend on viral word of mouth. It’s in the plan. So too with location, product development strategy, management team and compensation, lots of different factors. They’re all in the plan. They result in our natural startup level. There’s an obvious relationship between the amount of money needed and whether or not there’s funding, and where and how you seek that funding. It’s not random, it’s related to the plan itself. Here again is the idea of a natural level, of a fit between the nature of the business startup, and its funding strategy. It seems that you start with your own resources, and if that’s enough, you stop there too. You look at what you can borrow. And you deal with realities of friends and family (limited for most people), angel investment (for more money, but also limited by realities of investor needs, payoffs, etc. ), and venture capital (available for only a few very high-end plans, with good teams, defensible markets, scalability, etc.). Somewhere in this process is a sense of scale and reality. If the natural startup cost is $2 million but you don’t have a proven team and a strong plan, then you don’t just raise less money, and you don’t just make do with less. No — and this is important — at that point, you have to revise your plan. You don’t just go blindly on spending money (and probably dumping it down the drain) if the money raised, or the money raisable, doesn’t match the amount the plan requires. Revise the plan. Lower your sites. Narrow your market. Slow your projected growth rate. Bring in a stronger team. New partners? More experienced people? Maybe a different ownership structure will help. 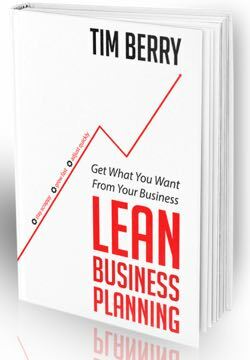 What’s really important is you have to jump out of a flawed assumption set and revise the plan. I’ve seen this too often: people do the plan, set the amounts, fail the funding, and then just keep going, but without the needed funding. And that’s just not likely to work. More important, it is likely to cause you to fail and lose money. Repetition for emphasis: you revise the plan to give it a different natural need level. You don’t just make do with less. You also do less. Otherwise, it’s not realistic. Nice explanations of how to realize the accounting. It helped me a lot to explain my employee how to realize a startup costs worksheet and let them understand why we need it. After a 2 days work we realized a simple management overview to monitor if we are still on target. By the way.I liked the font you used in the sample images.